Human children are notorious for getting all sorts of strange objects stuck up their noses – but, it seems young seals are now gunning for the crown, too. 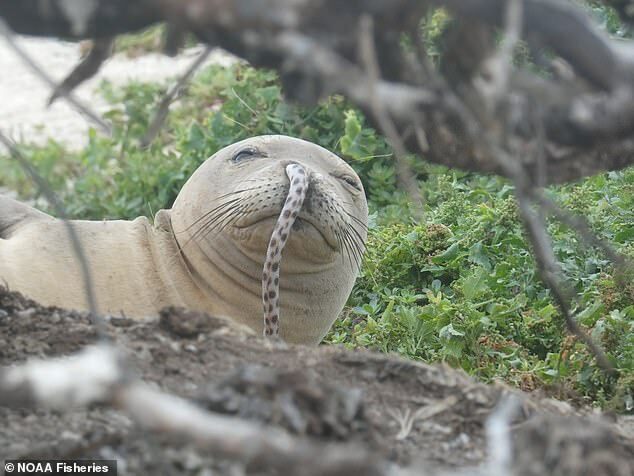 A photo shared by the Hawaiian Monk Seal Research Program has revealed the hilariously unfortunate predicament of a juvenile seal with a spotted eel lodged in its nostril. And, it’s not even the first time they’ve seen this happen. Baffled researchers have no idea how the seal (or the eel) found itself in this ‘slippery situation,’ though they suspect it has something to do with the way the mammals hunt. 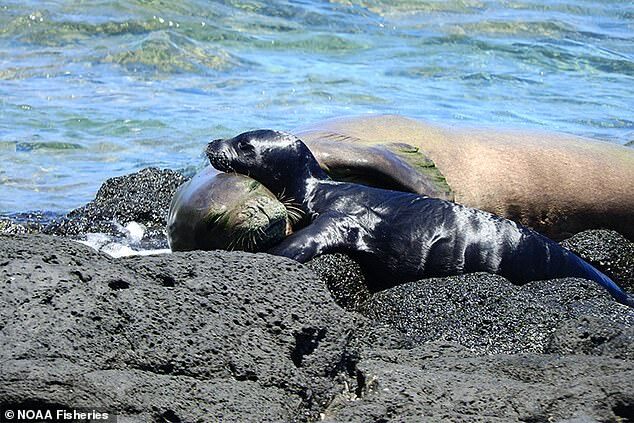 After spotting the bizarre pairing at French Frigate Shoals in the Northwestern Hawaiian Islands this past summer, researchers quickly acted to relieve the seal of its discomfort. Unfortunately, the eel’s fate wasn’t as lucky. According to the team with the Hawaiian Monk Seal Research Program, the strange phenomenon has been seen a handful of times in the past – each with the same outcome. ‘We have reported on this phenomenon before which was first noted a few years back,’ the team wrote in a Facebook post. ‘We have now found juvenile seals with eels stuck in their noses on multiple occasions. In an elaborated post on the NOAA Fisheries website, the experts say seals with an eel jammed up their nose have been seen three of four times over the last 40 years. And, the phenomenon has only popped up recently. ‘We don’t know if this is just some strange statistical anomaly or something we will see more of in the future,’ the NOAA post notes. Seals may be prone to this type of problem because of the way they hunt, the experts say. Or, it could simply be a case of swallowed food coming back up through the wrong pipe. So far this year, the experts say 30 pups have been born in the region. This is up significantly from the previous record set in 2013, when 21 pups were born. The refreshing news comes as researchers work to protect the endangered species, which is one of just two species of monk seal still in existence. Given the challenges these seals are already facing, the NOAA is keeping quiet about where exactly the pups have been born, and is asking the public to please keep away if they come across one of these pairs. ‘By not specifying pup locations in our social media posts, we can help keep disturbance to a minimum,’ NOAA revealed in a recent update. Either way, all can agree it doesn’t look comfortable. 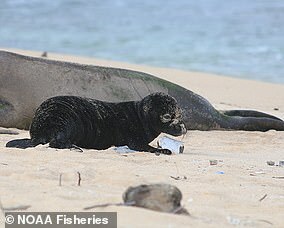 ‘Hawaiian monk seals forage by shoving their mouth and nose into the crevasses of coral reefs, under rocks, or into the sand,’ the NOAA team explains. ‘They are looking for prey that likes to hide, like eels. ‘This may be a case of an eel that was cornered trying to defend itself or escape. ‘Alternatively, the seal could have swallowed the eel and regurgitated it so that the eel came out the wrong way.